Amazingly crafted handmade blue pottery tiles with wonderful handcrafted design. Tiles have been used for centuries to create intricate patterned floors and walls. Tiles can be arranged in nearly limitless designs to create unique patterns for bathrooms, kitchen backsplash, patios and just about any other room in your house. Clay Wall Hanging Handicraft Product . A Unique Range of Home decor & Door Handing, Decorative items for office, Outdoor and Home. Blue pottery is art form with a fascinating recipe of distinctive material like the ground quartz stone, raw glaze, sodium sulphate, and multani clay. The color schemes are also peculiar like, Blue, Green and the White. An elegant bathroom set embellished with handcrafted design in vibrant colours. Place this set in your bathroom and start your day with its brightness. Blue Pottery is widely recognized as a traditional craft of Jaipur, though it is Turko-Persian in origin. The name 'blue pottery' comes from the eye-catching blue dye used to color the pottery. We manufacture a wide range of other pottery items that are made with extreme finesse by our craftsmen. 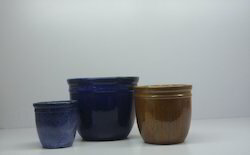 These pottery items are available in varied sizes and shapes to offer wider variety to the clients. We have casted and studio pottery. Studio pottery is handmade and casted is done by moulds. The ranges are : tea-set, morning set, dinner set, tableware, pots & lamps. Pottery and ceramics collection at Aesthetics is exquisite and one of a kind. No two pieces are repeated. our range includes, table ware, vases, urns, crockery, home accents and more. We are one of the reputed firms that manufacture and trade a wide range of Ceramic Pottery to meet the requirements of our clients. All these products are fabricated with premium grade raw material sourced from a reliable vendor in the market. The looks of these products are highly sophisticated and impressive as well. We are offering these products at affordable rates as per the demand.